© 2014 Parsifal 310 "Oorlogsstemmen" contains all music from the educational concert for youngsters about The Great War (1914-1918): title track "Voices Of War; the war poem "A Wooden Cross" by Siegfried Sassoon, music & Dutch translation by Guy Verlinde; "Let’s Work Together" from Wilbert Harisson; an updated version of "Give Peace A Chance" from John Lennon in Dutch & English, "Yser" & "99%" from the "Blood For Kali" album and instrumental versions of "99%" & "Voices of War""
Oorlogsstemmen/Voix De Guerre is an educational concert for youngsters about The Great War (1914-1918), with anecdotes, war poems and songs. Guy Verlinde also highlights some important historical "protest voices" as Martin Luther King and Nelson Mandela; the protest songs of Bob Dylan & John Lennon, and the power of music & art as a means of resistance against armed conflicts. Next to the concert Guy also developed the workshop “Protest song writing”, where youngsters learn how to write their own protest song, express their opninion & free their minds. 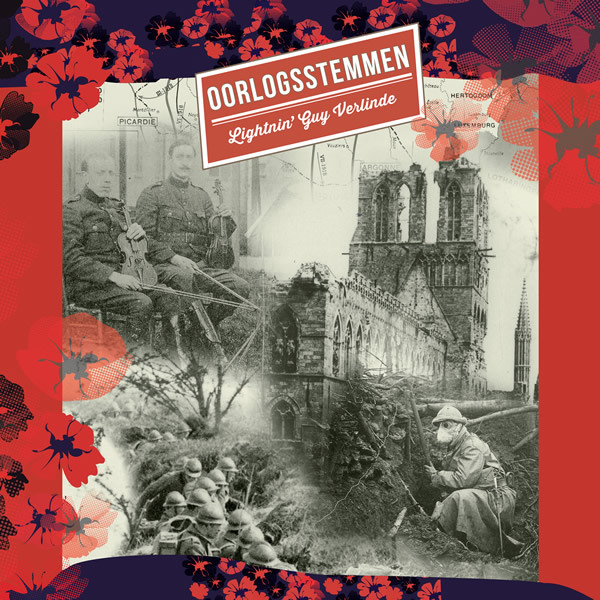 This project was made in co-operation with Jeugd & Muziek,/Jeunesses Musicales & In Flanders Fields Museum. Free Downloads of the instrumental Versions of Voices of War & 99%. Click on the link and then click on the download symbol "Symbool image" underneath the soundwave.